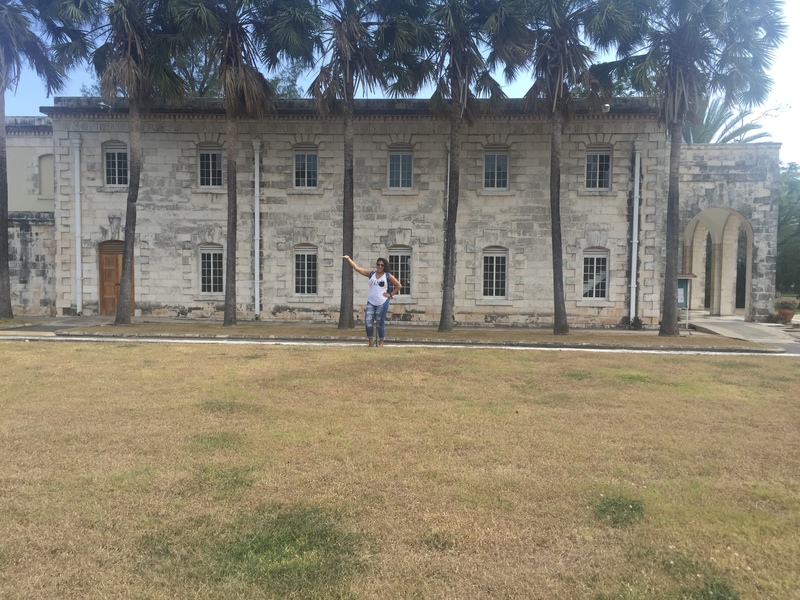 Study Abroad Blogs – Enjoying my new home, Jamaica! 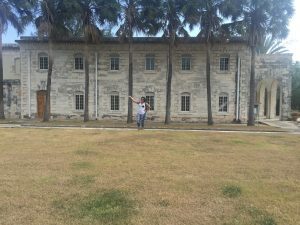 July 5th, 2016 was my second full day in Jamaica! So far I have been very happy although that is not how I felt initially. Leaving New York was super difficult, I was feeling paranoid and anxious because of the unknowns. My flight was delayed about two hours so I got to Jamaica later than expected but none the less my flight was interesting. The people were very vibrant and talkative during the delays which was nice. I was already getting a sense of the Jamaican culture just from my plane ride. My first full day in Jamaica was tiring but awesome. Getting acclimated to the sun and humidity is definitely challenge! 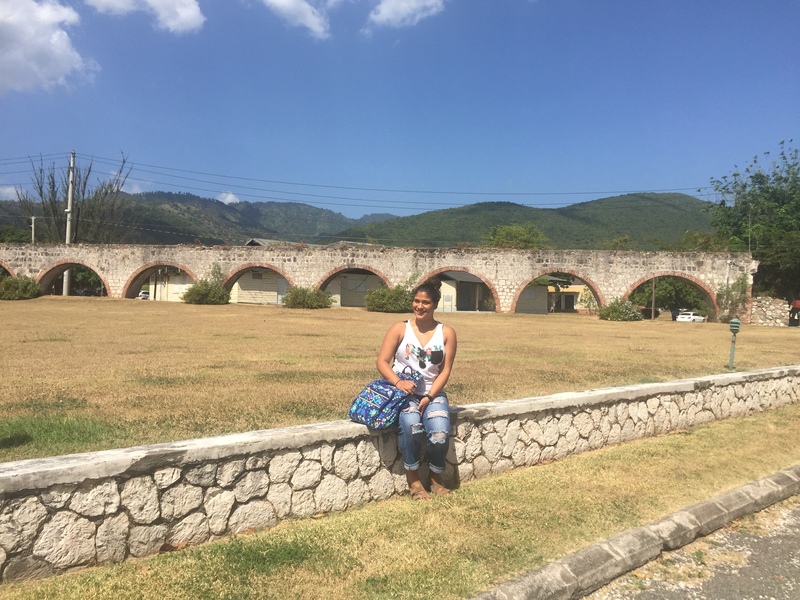 The sun the first day made me exhausted but the tour of the University of the West Indies (UWI) made it all better, especially with “the squad.” The UWI campus is beautiful, “hugggggee,” and has a lot of historical background. The campus was previously 2 plantations where slaves harvested sugarcane. There was an aqueduct connecting the Mona plantation and Papine plantation which is still around the campus. Fast Fact: Bones of the slaves have been found on campus during the construction of several buildings on campus and were put to rest elsewhere. Behind me is part of aqueduct and further in the distance are the famous Blue Mountains. In front of the campus library where there are many services and many rare Caribbean manuscripts. 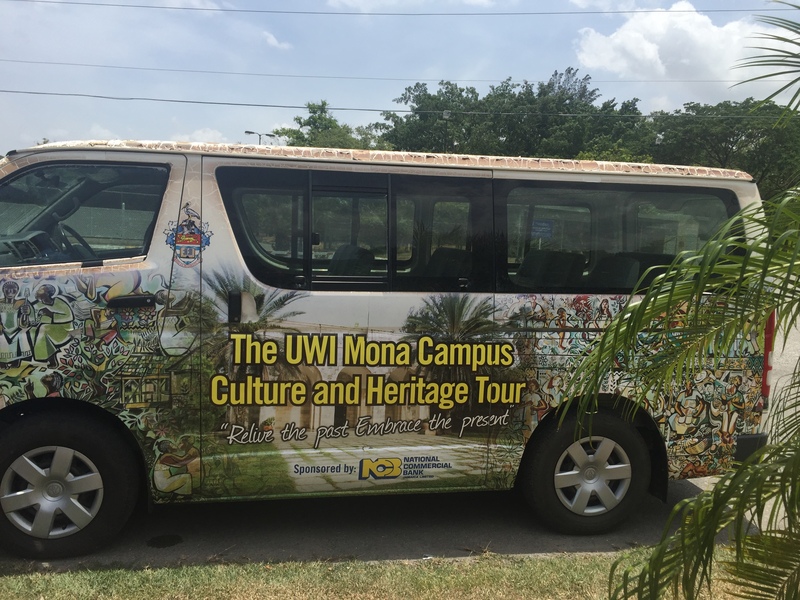 This is UWI’s chapel where many different religion’s services are held. This is a special place on campus. Inside there are flags of all the countries that make up the West Indies. 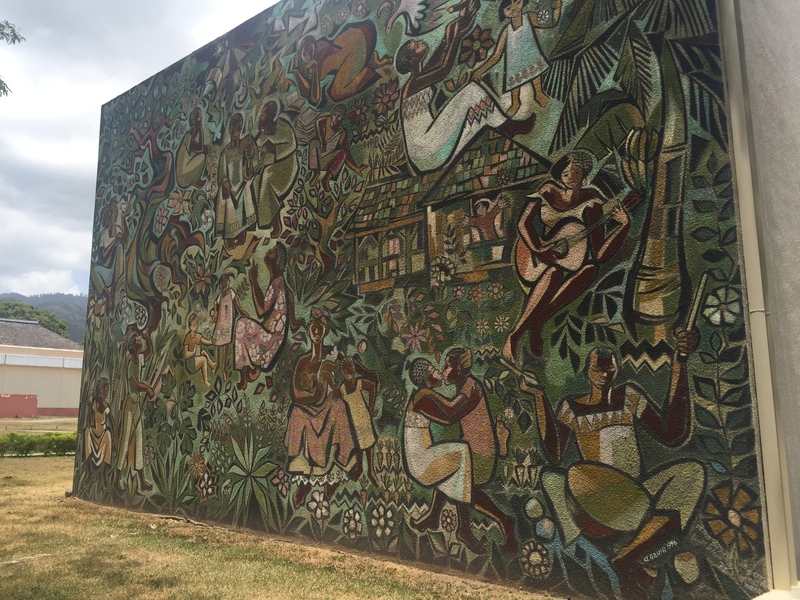 This is one of the murals on the campus. It is breathtaking because of the the different people and components. 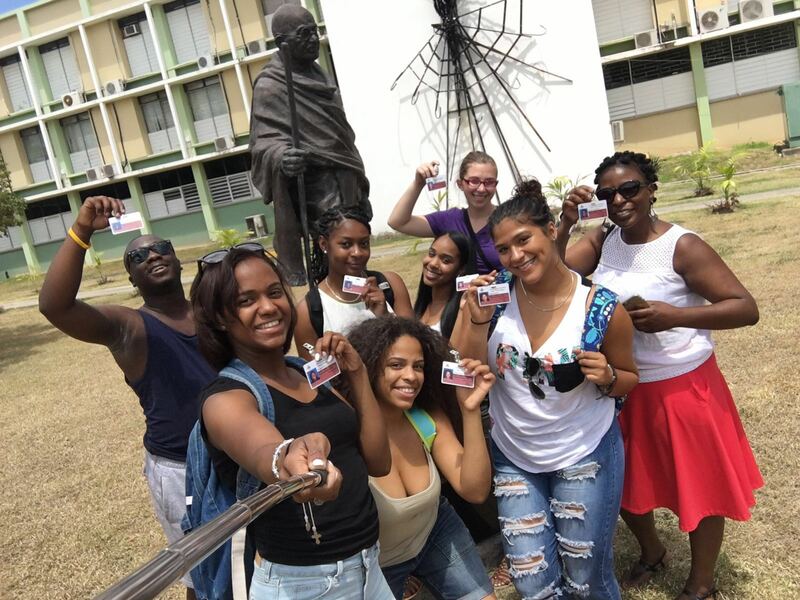 The Jamaica Squad after we got our UWI ID cards. We were finally official! This was the bus we traveled in for half of our tour! 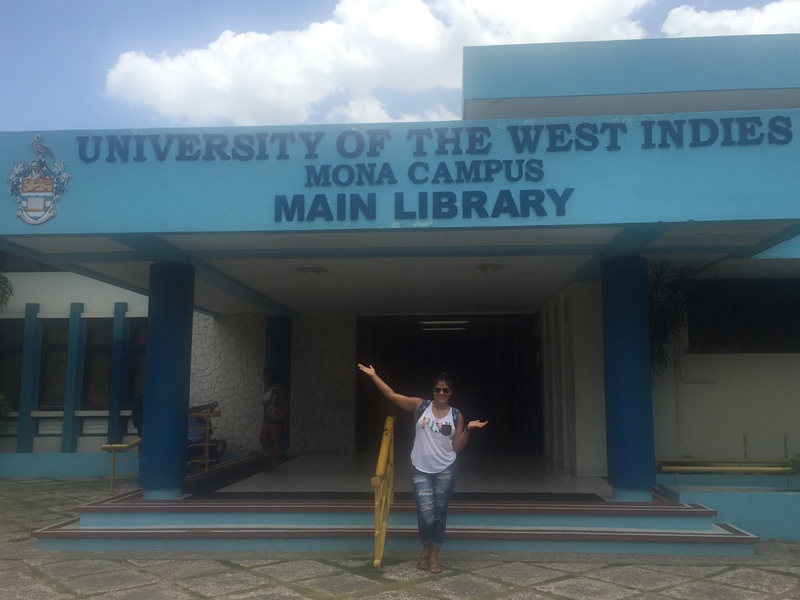 “Repping” UWI hard! After the tour, it was off to get my Digicell phone. I don’t have much service here so I bought a cell phone to stay in contact with everyone. My Digicell phone is an android. I am now fully connected and can call anyone in Jamaica. Lit! The first night sleeping in my room was great! I was exhausted from the walking and sun. The dorms are very different from the ones I am used to in New Paltz, they are smaller but yet very comfortable. When I first walked in I was so relieved to see a fan, it is very much needed. I leave my windows closed most of the time because of mosquito’s and am being really careful this time around because of Zika. There are no glass on the windows just the winding metal shutters with no screens. All the dorms are also very colorful… I love it! We also have a huge outdoor quad where the squad comes out to get wifi and to chill. 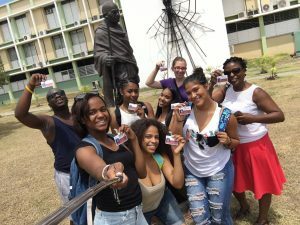 Check out this video from UWI’s Youtube Channel! Also do not forget to keep up with me on Instagram using the hashtag #SabInJam for my most recent post!